By Sue Chan - New Zealand - 17 Jun/03 - Viewed 2074 times. We had planned two nights in Hamilton to give us a break and this proved to have been a good idea as next morning it was still raining. Our large room at the Explorer Motor Inn had everything we needed including a full size bathroom, lounge area, dinning table and fully equipped kitchen. There was also a very comfortable super king size bed so we had a good rest before reading the paper, which had been delivered, and watching a program about N.Z. on Discovery Channel. By 10am the rain had cleared and that was the last we saw of it until late afternoon so, after smoko, we drove the short distance into the city where we parked at a supermarket and walked to the Information Centre. The assistant was very helpful and gave us directions for an afternoon trip west (also sold us a lot more tourist stamps). 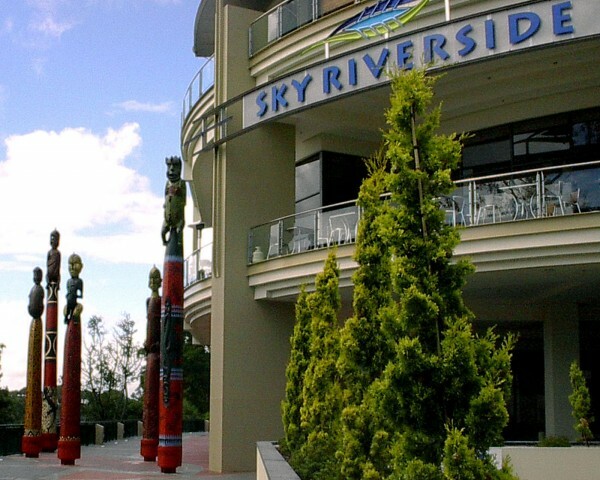 We went for a walk around the city, which seemed about the size of Rockhampton, through some shopping areas, past the Riverside Entertainment Centre, with talking poles, (they don�t actually talk, just have a story attached) which was built in 2002 and along the Waikato River Walk from Claudlands Bridge to Victoria Bridge. On the river we saw the paddle steamer MV Waipa Delta. This vessel came into service in 1877 and now takes visitors on cruises along the river. We passed the Waikato Museum of Art and History and turned into Victoria Street where there are many examples of interesting buildings from the1870s and 1880s. After lunch in Hamilton Central � a K Mart Plaza � we set off for Raglan 45km away along a very winding road. This is a nice small town with a beach famous for its left hand surf break where the swell from the Tasman sea meets the coast at an angle creating waves reputed to be the longest in the world � not obvious on this calm day. Near the beach there were acres of car park, which would be put to good use when the surf carnivals were on. Returning 7km towards Hamilton we turned off to Bridle Veil Falls, a 14km drive and then a 1km walk. It was raining again by now but these proved to be one of the best falls we were to see and well worth getting a bit damp for. Our original plan had been to continue along this road to Kawhia and then the Te Paia Hot-Water Springs but the road was unsealed and we considered it unwise to try it after all the rain so returned to Hamilton, reaching there by 4.30pm. On the T.V. we heard reports of flooding and landslides along the Coromandel Peninsula, which was where we planned to go next day. However the weather report promised conditions would improve so we decided to try it and next morning set off at 8.30. The road took us through flat farming country, quite a change from the past few days. At Te Aroha at 9.30 on a Saturday morning not much was open. This small town was founded in 1880 and developed by the Government as a tourist resort because of its thermal springs. In the Domain a number of buildings from this era survive and here the Mokena Geyser, claimed to be the only hot soda-water geyser in the world, is active every half hour, spurting to 3.5 meters. We were just in time to see it but too early to visit the Hot Soda Water Baths � what a pity! After about 20km we came to another small town, Paeroa, famous for its spring water from which a locally popular soft drink Lemon and Paeroa is made. We did try this and thought it tasted just like any other lemon mineral water. There is a 6.8metre high replica drink bottle at the entrance to the town to commemorate the discovery of the spring before 1900. Paeroa is on the N.Z. Antiques Trail but although we walked the entire length of the main street we could find nothing open. Perhaps small towns in N.Z. don�t open on Saturdays. We eventually found one caf� open and after a drink continued on the SH25 to Thames situated on the Firth of Thames at the beginning of the Peninsula. Here at the Information Centre we were told of a mudslide on the eastern side of the Peninsula that had blocked the road overnight. We particularly wanted to reach Coromandel Town so decided to continue on even if it meant retracing our steps. There was evidence of the heavy rain on the beaches as we travelled near the coast but the rain had cleared and there were lovely views across the Firth and further north over Manaia Harbour. At Coromandel Town the assistant at the Visitors Centre made some phone calls and found all roads were now open except for the inland route, which we had not planned to use, so we were able to relax and have lunch by the river with the ducks before exploring. The town prospered in the 1850s and 1860s when gold was discovered in the area. Today visitors can see a restored Gold Stamper Battery with New Zealand�s largest working wooden water wheel and the fully operating processing plant. Unfortunately the wheel could not be operated when we were there because of the rocks washed into the creek by the recent rain. Nearby is the Driving Creek Railway where a small train was installed in 1974 to bring clay from the hill to the pottery and wood for the kilns. Tourists can now take a ride through 5km of bush, over four high trestle bridges and through two tunnels. The return trip takes an hour � time we could not spare, maybe next time? Heading west we came to a lookout called Maungataururu at the beginning of the Kaipawa walking track. This looked west over spectacular Kuaotunu Bay. Here we turned inland until we reached Whitianga, a nice small town with a good shelling beach on the shore of Mercury Bay so named by Captain Cook when he visited the area on a journey to observe the planet Mercury. We drove to the wharf and watched the shuttle ferry taking passengers across to Cooks beach, gathered a few shells washed in by the rough weather then continued on for around 90km to Whangamata Beach. Here, while having a walk to stretch our legs, we realised that it was going to be quite late by the time we reached our destination so instead of the usual drink we had hot dogs on a stick which was a nice change and kept us going a bit longer. Waihi, 29km south, is another town developed after the discovery of gold in 1870s. This historic town has many interesting things to see and do including a steam train ride and a visit to the second-largest gold stamping battery in the world but not at 5.30pm on a Saturday afternoon. We had to be content with a walk along the main street seeing murals and statues and reading the plaques. One statue depicted children on their way home from school playing in the warm water in the drains coming from the mine. Katikati, 23km further on, (N. Z. towns are very close to each other) is becoming known as an open-air art gallery adorned with murals. We thought most looked like pictures rather than murals. Perhaps we were a little tired. There were a lot of them and we walked all around the main streets until we thought we had found the best for photos. It was here Ron took my picture with a �Kiwi Bloke�. We reached Tauranga on the Bay of Plenty, where we had booked a room, by 7pm. This is quite a large spread out town and by now the rain had started again but we drove directly to Academy Motor Inn (without a map!) arriving by 7pm after travelling 412km, another long sightseeing drive. The rain continued most of the night and into the morning and we left at 8.30 to drive into the city. It was very quiet of course early on a wet Sunday morning but it seemed to be a nice shopping centre. We drove around the Harbour, which was interesting, after which we had trouble finding our way back to SH2. After crossing a bridge and having quite a sightseeing tour we asked directions at a convenience store and eventually left by 9.30 for Te Puke, the �Kiwifruit Capital of the World� with the rain easing to showers as had happened most days. Here at the tourist complex you can learn all you ever wanted to know (and more) about kiwifruit. The lookout tower is in the shape of a kiwifruit slice. At the Visitors Centre we bought, amongst other things, a small bottle of NEKTA liquid kiwifruit, which was absolutely disgusting and eventually thrown out. We saw many kiwifruit orchards, which abound around the Bay of Plenty but did not linger as we hoped to reach Rotorua before lunchtime. At Okere Falls on the Kaituna River a group of young people were preparing to go white water rafting. From here we turned onto SH33 and arrived at Rotorua on schedule at 11.15.